Thank you all, again, for your comments and support! It means the world to me! Ah, the first to comment! Your mailbox must be full! He’s absolutely beautiful and I am not just saying that-you must be thrilled (and tired and shocked they let this tiny little creature home with you (LOL)). It’s a long process for us, but must be amazingly long for the husband who, although isn’t in any pain, is basically on his feet and alert the entire time not really knowing what is going on. I am so happy about the no c-section, no epidural-it was awesome wasn’t it? The most amazing, incredible thing I have ever done in my life. Enjoy him and I hope you all have a terrific holiday! Donna he’s absolutely beautiful! Congratulations!! Oh, Donna, he’s precious!!! We’re so glad hear everything went well!!!!!!!!! Donna.. i usually think babies are ugly little shriveled ppl but MILES.. OMG.. MILES is FABULOUS!! He is a beautiful baby boy : ) you did good Momma & it sounds like Daddy did good too. Congrats !!! Congratulations!! He is absolutely gorgeous! Congratulations to the proud parents! Love and hugs to the little one! Donna, what a beautiful baby boy! I’m so happy you had the no epidural, no c-section birth. That was a goal that didn’t happen for me, so I’m so very, very glad it happened for you! Don’t forget to sleep when Miles sleeps! Glad all went well. Thanks for taking the time to share a picture and to let us know how you are all doing. Definitely rest any time the opportunity arises. Yeah!!!! Welcome Miles!!!! Congrads mom and dad!!! Oh Donna, what a beautiful little boy! Congratulations Mommy and Daddy! Aww! He’s beautiful! Congrats on the birth of little Miles! I’ve had epidurals, an emergency c-sec, induction, vaccuum extraction, and on and on–I’m glad you were able to avoide some of that, lol! Absolutely precious! Enjoy this time, cherish it, because it goes by way too fast…I can’t believe that my baby will be 3 years old next month. Cangratulations! Congratulations, he is so precious, I hope he brings you much joy! So cute! Congratulations Mommy and Daddy, welcome little Miles! Congratulations, I’m so pleased for all of you. Wow, Donna! Miles is beautiful! I am so very glad all is well. Congratulations! Ahhhhh, He sure is a cute little mater–lol. So perfectly beautiful. And tell you congrats, and am glad that all went well, and good to see that you are now on the resting side of the great event…. CONGRADULATIONS!! I’m so happy for you and mr tomato and miles!! He is absolutly adorable!! I can’t wait to see more photos!! Good lookin kid. I’m glad Sherry and didn’t have to go through all that labor stuff. You did a great job. Congrats!!! Donna, he’s gorgeous!!!! Congrats on a job well done! Congratulations!! All newborns are beautiful, but Miles is especially gorgeous! He looks so serene in the photo. I’m thrilled that it went so well for you. Words can’t describe how beautiful baby Miles is… His rosey cheeks, dimpled chin, rosebud mouth, pert little nose… And the fresh baby smell that catches your attention every time you gaze down at him while nursing. Enjoy the new member of your family, each day is more precious than the one before it. Congratulations, he is so beautiful. such a perfectly beautiful baby! Awww Donna he’s beautiful!! Congratulations! Your baby boy is just so beautiful and you both seem to be doing just great.. Congratulation’s to you and daddy..
Take care and try to sleep! Omg, he’s absolutely gorgeous! Big congrats to you guys and enjoy your holidays with him. Congratulations Donna! Miles is so cute!!!! Lovely babyboy!!! Congratulations! What a beautiful boy. I am thrilled for you and your family and I wish you all the happiness for a life filled with “Miles” moments. The journey begins. Mazel Tov! He is beautiful!! AWWWWWWWWW! Congratulations!!!! The 14th is my birthday too! This is the first time I’ve ever visited your blog and how lovely to be met with a photo of a brand new beautiful baby boy :) Congratulations! You have every reason to be very, very proud. Donna, I’m so happy for you and your husband. Miles is soooooo beautiful. He’s a perfect angel! He shares a birthday with another beautiful child, my nephew Nathaniel (just turned 2). Congrats again! Happy Holidays!!!! Congratulations everybody! He’s a cutie!! oh donna! he’s just beautiful!! i’m so so happy for you and hubby! So glad to here everything went so well. :) I was thinking good thoughts for you and hoping everything was ok. Enjoy your new bundle of joy! Congratulations to your whole family. What a beautiful picture! Looking forward to more pictures. You have one precious bundle of Joy there. Congrats to you and hubby on the new addition. Aww, what a beautiful baby! :) Congratulations!!! Donna, he’s perfect. (of course you know that!!) Glad everything came ot alright (pun intended!!). Congratulations to you and your husband. He is a beautiful baby boy!!! Glad you could deliver natural and that he is feeding well. Get plenty of rest, when you can. Take Care! Congratulations to you and congratulations to your husband!!! A beautiful baby!!! Congratulations! Your son is a beautiful baby. I wish you and your whole family the very best. What a beautiful early Christmas you’ve had this year! Mile looks so sweet and peaceful,Congratulations to all of you! !You’re all stars! CONGRATULATIONS! What a beautiful baby boy. I am so happy that you received such a wonderful holiday present! Congratulations!! I’m very happy that everything turned out the way you wanted. Beautiful Baby Boy! Enjoy that new little miracle! Congratulations! He is adorable, and what a great day to be born on … you beautiful boy shares a birthday with my beautiful boy — though my son is 4 years his senior. What a cutie pie! Congratulations! Thank you so much for taking the time to update us and share a picture. Donna and family: congrats on your new addition… He’s sure a little doll!! congrats!!!!!! He is simply gorgeous..
DITTO DITTO!!!! He is absolutely perfect! …same day as my brothers birthday…. what a great gift before Christmas. Oh, so precious!!! Glad to hear that all is well with all of you. Congrats & best wishes, Enjoy!! Donna, I’m so glad to read this. I just got back from vacation, and am catching up on bloglines…Congratulations to you and your husband on the new addition to your family! Can you imagine what next Christmas is going to be like for you? Congratulations, Donna. He is super precious! I hope to see lots of pictures of him after you all get settled in. Hooray! Your baby is lovely, and I’m giving you a huge high-five on the no-section, no-epidural birth! You are wonderful! Your husband is wonderful! Miles is wonderful! Hooray! He is absolutly beautiful, looks like a living doll. Congrats to you new mommy I wish you only the best for the years to come. Being a mother is the most wonderful experience in the world and the best job you could ever be awarded. Enjoy your little one they grow up way to fast. Miles is so adorable. I wish you and your family a happy holidays. It will be extra special for you this year. Welcome to the world Baby Miles, you are a beautiful little addition to it. I am thrilled for you, that everything turned out so great! Miles, you are adorable – do you realize how many women are drooling over you already??? Kudos to daddy for doing an outstanding job as well. May you all be blessed with the best that life has to offer you, to match the love that has gifted you so beautifully! I’m so happy for you and your family! Congratulations. He’s so cute!!! 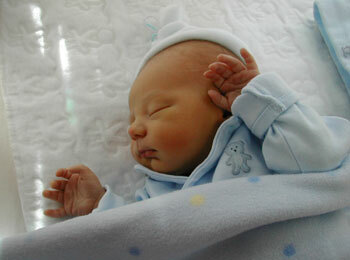 Congratulations,he is a lovely baby. He’s absolutely beautiful. Enjoy this time – It will fly by. I’m sure you’ll get lots of advice from everyone; I’m a new mom too, so I can relate. So, here’s my advice: trust your own instincts, and you’ll do fine. Sorry, Miles, I’m a bit late! But boy, you are absolutely handsome! What took you so long to come? You should know you cause a little bit worry to your mom … but all is okay now, I think! :) Welcome, Miles! Miles is gorgeous! Congratulations! Life will never be the same! You never knew you could love someone so much! Happy Holidays! What an amazing, beautiful little guy! Congratulations! 10 Fingers and healthy, the perfect little boy! He is so cute… what is the pattern, I want one just like it! He is adorable. too bad your administrators took the opportunity to start harrassing those of only one certain religion right after you left. I certainly hope all Christians leave your board, because to harrass us is wrong. I am certainly telling everyone to leave. Too bad you have people you can’t trust running the board. I certainly don’t. My oldest child and only son, Mike was born Dec. 18th eleven years ago. Every year I look at him and think what a cool Christmas present! Now you have the same! :) Congratulations! He is just perfect. Congratulations! Congratulations, Donna on your new little one. Miles is absolutely beautiful!!! I’m glad to hear you had a successful delivery. I wish you all the best. After 107 comments, what can I say that hasn’t already been said? Miles is absolutely adorable. Congratulations to you and your husband!